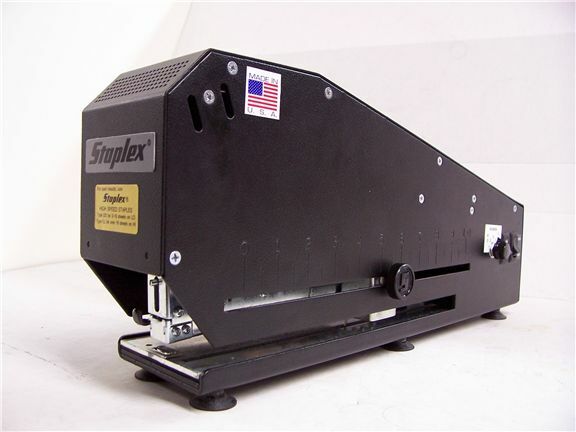 Staplex® S-700-1NHL Long Reach Automatic Electric Stapler - Now with "pop-out" front loading and foot-switch ready! Adjustable depth to 9‑1/4" (23.5 cm)! A Staplex exclusive! Weight: 17.8-lbs. (8.1 kg) Dimensions: 3-5/8" wide, 17-1/4" deep, 7-3/4" high (9.2 cm x 43.8 cm x 19.7 cm). Model S-700-1NHL: Long Reach Automatic Electric Stapler � 110-125 volts, 50-60 Hz AC. Model S-700-1NHLA: same as above for 220-230 volts, 50-60 Hz AC. 70N-BS Adjustable Backstop (left and right) for aligning work when using electronic Foot Switch [maximum 10-1/4" (26-cm) reach]. If work is folded first and then stapled, we recommend Staplex Model SS-45NHL Electric Saddle Stapler. 10-1/4" (26 cm) reach for up to 40 sheets of 20-lb. paper or equivalent! Heavy duty all metal construction and optional built-in depth guide!